Prior to the start of the 2017 College Football season, we made 26 predictions for the season. Those can all be found here. Below we will list and then review how each prediction turned out. 25. Appalachian State will win the Sun Belt – This was correct as App State went 7-1 and tied with Troy for the Sun Belt. 24. (Sun Belt) New Mexico State’s bowl drought will extend to 57 years – We were wrong on this and NMSU not only got back to a bowl, they also won it. Congrats Aggies! 23. (C-USA) The four teams wearing green will not win 25 games combined – Marshall won 8 games, North Texas won 9, UAB won 8, and Charlotte won 1. The biggest surprise was UAB who made a big statement after not playing football for 2 years. Bill Clark did a phenomenal job of getting UAB ready for football. 22. (C-USA) Both FAU and FIU will make a bowl game – Both teams did make a bowl game and FAU really made noise with Lane Kiffin at the helm. The Owls went 11-3 and won the C-USA Title while FIU went 8-5. 21. (Independent) Army will reach a second straight bowl game – Army not only reached a bowl game for the second straight year, they defeated Navy again, and also won a bowl game again. The Black Knights made it back-to-back bowl games for the first time since 1984-85 when they also won both bowls. Result: 3 out of 5 predictions were correct. 20. (MAC) Akron will win the MAC East – This was correct as Akron went 6-2 in the MAC. The Zips did not fare well to end the season as they lost to Toledo in the MAC Championship and FAU in their bowl game. They finished 7-7 on the season. 19. (MWC) Boise State will lose at least three games – This was correct, but it looked bad for most of the season. A regular season finale loss to Fresno State got this over the top, but the Broncos exacted revenge on the Bulldogs with a victory a week later in the MWC Championship. Boise State went 11-3. 18. (MWC) Air Force will reach a bowl game – The Falcons were unable to overcome a 1-4 start and three straight losses to Army, Wyoming, and Boise State made this an incorrect prediction. 17. (AAC) 9 teams will make a bowl game – This was short by 2 teams as only Tulane came up a game short of bowl eligibility. 16. (AAC) – South Florida and Memphis will play in the AAC Championship Game – This was half-right. Memphis took care of business in the West while South Florida’s instant classic against UCF saw them come up just short. UCF went on to win the AAC Title along with the Peach Bowl over Auburn in a great year for them. Result: 2.5 out of 5 predictions were correct. The running total is 5.5 correct out of 10. 15. (Big 12) Oklahoma State will lead the Big 12 in points scored – Oh was this a close one. The Cowboys averaged 45 points a game. Their rival Oklahoma outscored them by 0.1 points per game. So close. 14. (Big 12) TCU will win the Big 12 Championship – TCU made the game, but failed to seriously threaten Oklahoma in either the regular season or Big 12 Championship matchup. 13. (Big 12) Iowa State will reach a bowl game – The Cyclones really hit the map with wins over Oklahoma (on the road) and TCU (at home) in the span of three weeks. Iowa State went on to make the Liberty Bowl and win it 21-20 over Memphis. 12. (Pac-12) Washington State will reach double digit wins – Another prediction that was close, but ultimately wrong. The Cougars listlessly played against Washington and Michigan State to end the season with back-to-back losses and finish at 9-4. 11. (Pac-12) Colorado will reach a second straight bowl game – The Buffs went 3-0 to start the season and then subsequently went 2-7 in Pac-12 to miss a bowl by a victory. Result: 1 out of 5 predictions were correct. The running total is 6.5 correct out of 15. 10. (Pac-12) Washington will win the Pac-12 – The Huskies went 7-2 in the Pac-12, but losses to Arizona State and Stanford prevented them from competing in the Pac-12 Championship. 9. (ACC) Lamar Jackson will not win the Heisman – This was likely due to the sky high expectations and in the end it was Baker Mayfield who won the 2017 Heisman Trophy. 8. (ACC) North Carolina State will win at least 10 games – This was yet another close call that ended on the wrong side. NC State had 9 wins with their losses to South Carolina, Notre Dame, and Clemson. 7. (ACC) Florida State will win the ACC – This was over before the Alabama game even finished. The Seminoles struggled all season after Deondre Francois went down against the Tide. FSU finished 7-6. 6. (SEC) Missouri will have the SEC’s highest scoring offense – This one came through thanks to Alabama’s last 2 games in the College Football Playoff. Missouri ended the season with 37.5 points per game and Alabama finished with 37.1. Of course, the Tide do not care about stats because they won the National Championship. Result: 2 out of 5 predictions were correct. The running total is 8.5 correct out of 20. 5. (SEC) A 2nd year head coach will win the SEC East – This was spot on as Kirby Smart led Georgia to the SEC East and SEC Championship. The Bulldogs made the National Championship game, but lost a 26-23 thriller in OT to Alabama. 4. (SEC) Auburn will win the SEC West – Another correct call as Auburn upset Alabama in the season finale to win the SEC West. The Tigers ended the season with losses to Georgia in the SEC Championship and Central Florida in the Peach Bowl. 3. (Big 10) Northwestern will win at least 9 games –Northwestern did one better winning 10 games in a very good season for the Wildcats. Their losses were to Duke, Wisconsin, and Penn State as they went 10-3. 2. (Big 10) Michigan State will miss a second straight bowl game – The Spartans made this look awful as they went 10-3. We still like the Spartans to be a Big 10 and College Football Playoff contender for the 2018 season. 1. (Big 10) The Big 10 will win the National Championship – No Big Ten team even made the College Football Playoff to give this one a shot. Both Ohio State and Wisconsin were on the outside looking in. 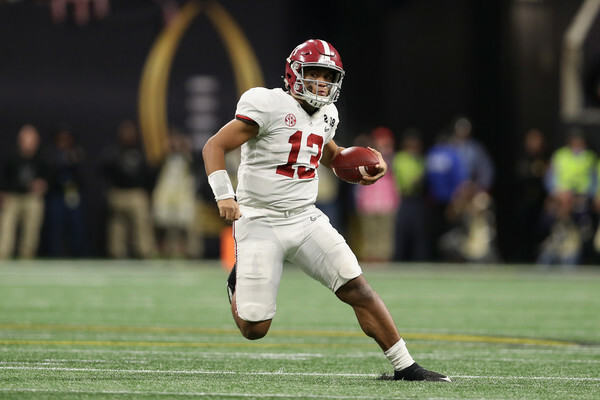 The SEC monopolized the National Championship with Alabama winning over Georgia. Bonus: At least 10 FCS teams will defeat FBS teams – It is fitting the bonus prediction was like a lot of other incorrect predictions: just missed. 9 FCS teams upset FBS opponents as no late season FCS surprises could see this one come true. As an aside, congrats to North Dakota State on their 6th title in 7 seasons after beating James Madison in the FCS Title game. Result: 3 out of 6 predictions were correct. The final total is 11.5 correct out of 26 for 44.2%. In 2016, we correctly made 30.5 out of 55 predictions for 55.5%. We look forward to the 2018 season!